to the people of Yunnan by awarding Michael the Yunnan Friendship Award (彩云奖). Ten foreign experts received this award in 2008. Here, winners pose with provincial leaders. Kunming's year-round flowers helped make the stage beautiful for all the media cameras present for the festivities. 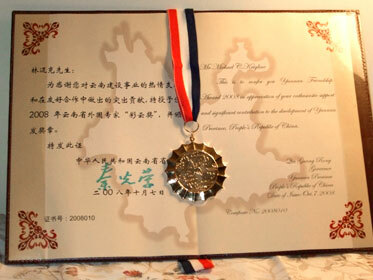 Michael Krigline was one of ten recipients of the 2008 “Yunnan Friendship Award,” presented each year by the Yunnan Provincial Government. The award is presented annually to foreign experts working throughout Yunnan who have made an outstanding contribution in fields such as business, agriculture, medicine, and education.  Recipients in 2008 were from the United Kingdom, Thailand, Japan, Myanmar, India, France and the United States of America. The award ceremony was held on October 28, 2008 at the Kunming Green Lake Hotel. Deputy Governor Luo Zheng Fu, on behalf of the provincial government, presented each winner with a golden medallion, an official certificate, and a cash prize. 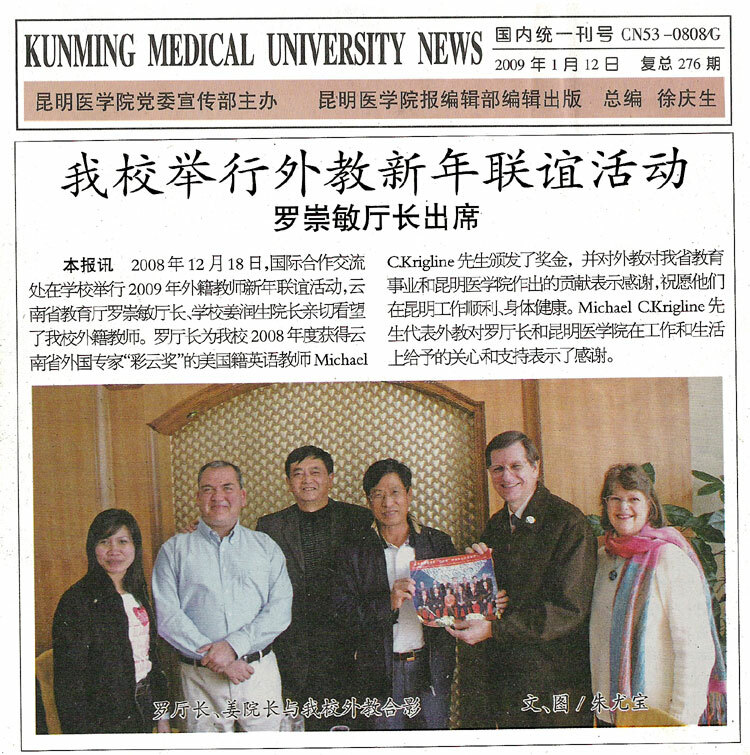 We understand that the Kunming Medical University's Foreign Affairs Department, Foreign Languages Department and Graduate School worked together to nominate Michael for this award, in recognition of the effort he puts into creating materials for and giving extra time to KMU's students, as well as for the time he invested to write the recently-publish textbook, Advanced Writing for the Real World, and for Michael and Vivian's work as Trustees of the Jian Hua Foundation's orphan-care projects in Yunnan. (Left) Vivian and Michael pose for a moment after enjoying a delicious banquet. (Center) Yunnan's Deputy Governor, Luo Zheng Fu, offers congratulations during the award ceremony. (Right) Tina Guo and Liu Hong from the Kunming Medical University Foreign Affairs Office. "This is to confer you Yunnan Friendship Award 2008 in appreciation of your enthusiastic support and significant contribution to the development of Yunnan Province, People’s Republic of China." We were quite surprised when we were told about this honor, and we are deeply moved to know that so many leaders have taken notice of our work. Of course, we don't pour so much time and energy into our community in order to win awards. We do it to meet needs and, in our own small way, change lives. But it is always nice to know that one's work is appreciated. 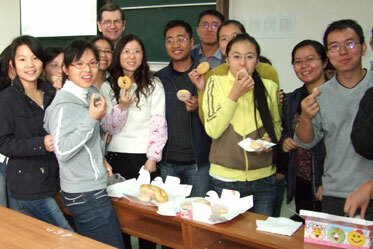 The first thing we did with the "cash prize" was buy cakes and doughnuts so we could share this celebration with Michael's students. You can tell from the smiles that it was a good idea! This shows the head of the Education Department of Yunnan Province, along with Kunming Medical University's president (beside him), giving me an official copy of the group photo taken during the award ceremony. This presentation took place at a Christmas Eve luncheon for KMU's foreign teachers, hosted by my university Foreign Affairs Office. The two teachers on the left are from France and the Philippines. "Whoever desires to become great among you, let him be your servant."